A friend and I popped into Cylie Artisans Chocolatiers on opening day, September 17th. The new store is located at 204 Dalhousie Street just north of the ubiquitous Bridgehead. My friend knew the owners and while they chatted it up, I cruised the display cases to see what jewels were in store for me. I love a high quality bar (locally I had been seeking out Hummingbird's because it is bean-to-bar or Ludwig's because he has lime bar) but I don't tend to be as attracted to filled chocolates. Partly because my likes are so narrow - citrus, raspberry, mint and caramel. I don't enjoy tea-infused or flowery scents like lavender. The mister is more of the chocolate aficionado than me. To give the chocolates their due I had the mister do a taste testing with me. 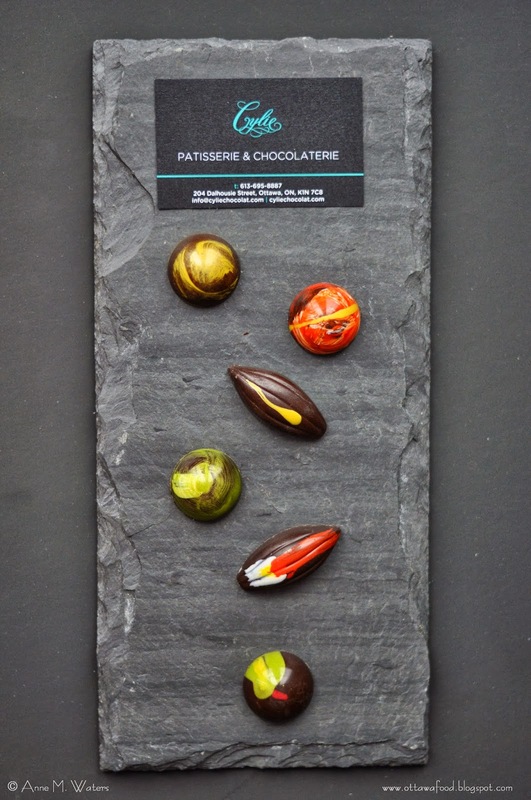 Cylie's chocolates are not fondant fillings but flavour-infused ganaches, including some with their own teas. They also do bars and specialty items like chocolate dipped orange peels. The mister agreed they were all lovely and very high quality. His favourite was the Sweet + Caramel. Mine was the Milk Granduja + Pear William. We found that the infused flavours were not overpowering and sometimes almost not noticeable. Thankfully the creamy ganache is delicious on its own. The name Cylie is a blend of the partners' names - CYril Nebout and LesLIE Yang. Both have pedigrees from Le Cordon Bleu, where they met here in Ottawa when Nebout was recently teaching. 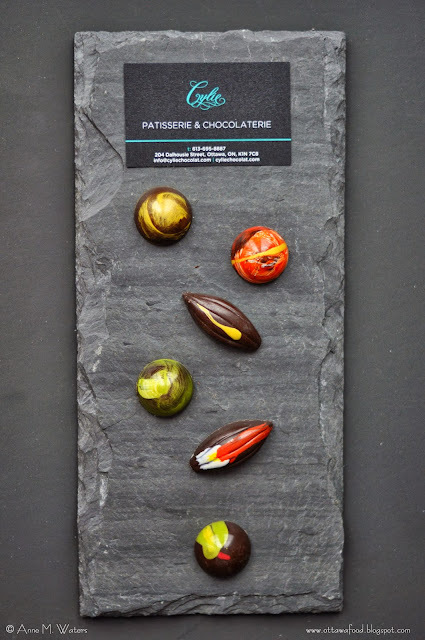 With three chocolate shops within 600 metres of each other on the Dalhousie strip (Stubbe is further south and Bernard Callebaut is in the middle of those two), how is Cylie going to set themselves apart from the pack? Stubbe's chocolate-making genealogy goes back to 1845 through six generations. The Bernard Callebaut store is an outlet for chocolates made in and shipped from Calgary. Their chocolates are not made in the Ottawa store. The Bernard Callebaut name is highly regarded (though has a complicated past - but that's another story). Cylie wants to present itself as a more modern twist on style and flavours, while maintaining the traditional techniques behind proper quality chocolate-making. They enjoy presenting an artistic flair to their work. I was just a fly on the wall during my first visit. How pleasant to receive a 'Well, hello again. I remember you.' greeting when I returned last week to stock up. I will have to check this out to continue my search for the best taste in town! thanks! I just bought some more flavours to try. A decent research project for sure.